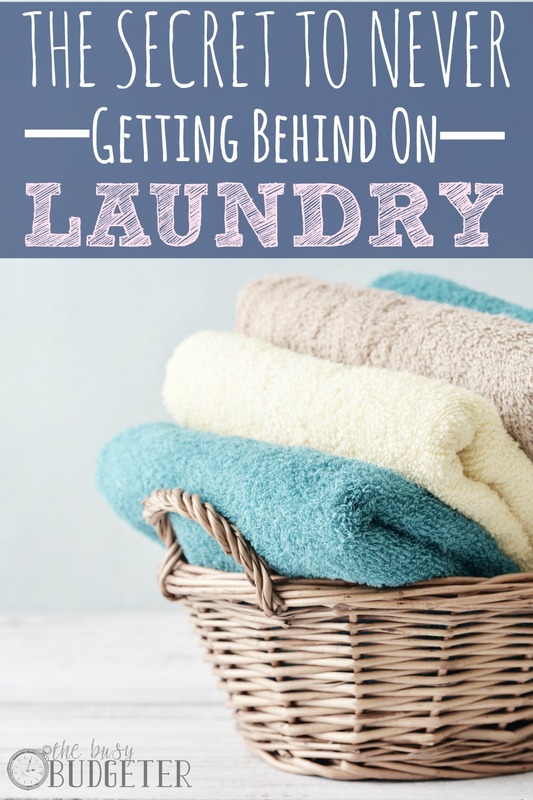 One of the first things you should do when you're trying to save money is set up laundry routine so you can stay on top of it easily. Sound ridiculous? Let me convince you. Saving money is about 20% plugging numbers in and making financial decisions, and 80% establishing routines to support your new lifestyle. If you try to tackle the budget alone, it’s an endless cycle of “life getting in the way”. You fail, get disappointed and start the cycle all over again. Let’s just skip that whole mess. Most people fail at implementing a budget because they try to implement only one solution (like creating the budget) and don’t understand that several things need to change at once in order to be effective. For example, you can’t cook at home to save money if you haven’t established a routine of dish washing, a routine to go grocery shopping, and a routine to plan menus. There are only two things that make your home and life run smoothly. They are the basis of everything that you do, and when these routines are established they will positively affect your finances, health, your weight, your social life and your attitude. Laundry and Dishes. If you can keep on top of those, your life will improve dramatically almost instantly. By “resetting” both the dishwasher and the washing machine every day, you will be caught up in a few days and you will never be behind again. The secret to the perfect laundry routine is to never do more than one load each day. The best part? Very likely this will be less work than what you’re doing right now. The secret is simplicity. Don’t do more than one load a day. EVER. Do your one load, and then move on. (Unless you have a ton of people in your house… We'll talk about that in a minute). Establish different baskets (piles on the floor would even work in the beginning), one for whites, one for darks, and one for towels/blankets. We use a 3 bag laundry sorter that works perfectly for this. Rotate through the piles each day. When we don’t have the clothes we need clean (gym clothes, uniforms, awesome “going out” clothes that fit), we tend to just not do that activity so we can “catch up”. When we don’t have the dishes clean that we need to cook, we tend to order in or eat out. While we might have the energy to cook for 15 minutes, we don’t have the energy or the patience to put away the dishes, load the dishwasher, wait an hour, unload the dishwasher and then cook. By establishing a routine in these two areas, you immediately have a load off your back! If your apartment isn’t dusted and clean it honestly doesn’t matter as long as you have the things you need to live your life. Find a time that works for you. It needs to be consistent, every day. We’re not looking for hours. I want you to find three time-blocks of 10 minutes each that you can fit this in every single day at the same time. Example: Put a load of laundry in every morning before you leave for work, switch it to the dryer as soon as you get home, fold and put it away before you relax for the night. I know how overwhelming laundry can seem. It’s so incredibly easy to put it off. “Just one night… I’ll just take tonight off and I’ll do two loads tomorrow.” Here’s the thing though… if you do this for 28 days straight, it won’t be overwhelming. Is it overwhelming to use the bathroom every day? Brush your teeth? Get dressed? You don’t even think about those things because you have a well established routine for them. It takes 28 consecutive days to create a routine. It’s not easy. There will be days that you don’t want to do it. But you’re not giving up on me. Put that laundry in every single day for the next 28 days. Put an alarm on your phone to go off every day at the time you want to switch the laundry. In 28 days, the laundry won’t be something that’s looming over you all day. It will be easy to keep up. You will never stare at a giant pile of laundry or sacrifice a Saturday to wash clothes all day ever again. You can, In fact you can do it in less. I timed myself just a few minutes ago. Keep in mind that I’m not a star athlete. I’m a mom with an 11 month old crawling up one leg and a 3.5 year old screaming that he flushed his underwear as I did laundry… so, yeah. You can beat these times. Putting laundry into an empty washer: 55 seconds (including washing my hands because I hate touching laundry detergent). Folding and putting away laundry (into three bedrooms all on the same floor): 4 minutes 49 seconds. Don’t believe me? Prove me wrong. Time yourself and leave me a comment. Nope! In fact, I’m going to forbid it. (I’m just kidding, I can’t actually forbid you to do anything. But seriously… just do one load). When we play catch up like that, we tend to skip days after. Either because we’re absolutely sick of laundry or because we feel like we earned a day off since we’re caught up. When we methodically do one load a day, you’ll catch up automatically, over time without getting burned out. In my family, on average we need to wash 2 adult pants, 2 kids pants, 2 adult shirts, 2 kids shirts, 8 socks, 3 pairs of underwear, gym shorts, a gym top and a sports bra. I can easily fit in about 5 or 6 more things. Depending on your washer, maybe even more. You’ll catch up automatically, over time and you’ll never get back into this cycle if you do this the slow way. Keep in mind too that you aren’t the only person in your family. Laundry is a great job to delegate. If your husband can’t stand folding, but doesn’t mind switching laundry out, have him put the laundry in and switch it. Then you swoop in, fold it and put it away. It’s incredibly hard for many moms to ask for help or admit that they can’t do it all. If you have someone that you can get to help, jump on that. Keep in mind that if he’s never done laundry, this is a new routine for him too and he’ll have similar struggles as you. If you have 1-4 people in your house, do 1 load. Never more than one load. If you’re a family of 4-6, you can do two loads (often times 1 is enough, start by doing one and see what happens). If you’re a family larger than 6, then buy a high capacity washing machine or delegate extra loads to other members of the family. What about towels, linens, sheets etc.? Work smarter, not harder! Assign everyone in your house 2 towel sets. They make fancy color matched sets of towels, but between you and me, a sharpie initial in a corner of your old towel works just fine. Drying your clean body on a clean towel doesn’t make that towel dirty. Everyone uses their towel for the week, then tosses it in the laundry at the end of the week. Distribute the second set of towels, wash the first set and reset. The same can be done for linens and pillow cases. One set per bed, every week. Then switch them out. Depending on how full your loads are, you can divide these up and wash a set with each days load or just add an extra load on a weekend (or whatever day you have off). Depending on how many guests you routinely get, you can decide if you want to have special guests towels and sheets or if you just want to put both sets into action when you have guests. Determine how many loads a day you need to do. Find a time that you can put in a load, switch it over, fold, and put away, every day. Decide if you will delegate part of this task. Set a phone alarm to remind you of the time to switch laundry. Sort through your towels and assign two towels for every member of the family and label them (Sharpie works). Sort through sheets and pillow cases to make sure that every bed has 2 complete sets and label them. Don't wait. Do it right now! Well, how long did it take you to fold your laundry and put it away? You are about to change my life. I am so glad that I heard you on Side Hustle Nation! This is just what I’ve been looking for – and right on time for the New Year! Thank you!! With my family of four (including a 4 year old and a 5 month old) I have tried to assign each day it’s own laundry (like Towel Tuesday) and then only do that load that day. 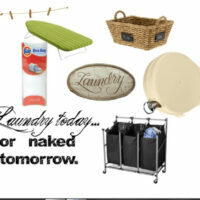 However, when it comes to doing mine and my husband’s laundry, there are many items we hang up or lay flat to dry. This is where I end up feeling behind and getting discouraged because the laundry doesn’t get completely done in one day. Do you have any suggestions? Can you hang the “hang to dry” stuff right on a hanger and put it up in your closet or on a valet hook on your bedroom door? Then when it’s dry, it’s all set to put away. For the stuff that needs to lie flat to dry, like hand knit items, I always do those early in the day and put them out on a flat mesh drying rack on my bed with a fan blowing on them, so that they dry before bed, and I have to fold and put them away before I go to bed. The screen dryer folds down flat and stores under my bed. Search for “stackable sweater dryer” or “sweater drying rack” on amazon. I can’t wait to try this out!! 1. I share one washer and one dryer with 6-7 other people in 3 other apartments in a four-plex. 2. The other tenants do their laundry randomly, and will take my laundry out if I leave too long. Frustrating to have to wait around for facilities to be free. 3. 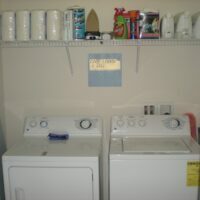 The washer/dryer are pay, and extra small-apparently they want us paying for many loads. 4. I can’t afford to do laundry every day, and if facilities are in use, a laundromat is even more disgusting. I love your advice, but unfortunately it doesn’t apply to all people. We’re a family of two… We can go weeks without doing laundry and get caught up in a day (a sucky day). We also go days without needing to run the dishwasher. I might try to modify your system to, “run a load of laundry OR a load of dishes every day” and see if the power of habit takes hold. But I’m not willing to waste water for it, I think we still might run out of things to wash in a full load pretty quickly. I live alone and in my biulding we share the washer/dryer. I have to pay to use those. I cannot afford washing my clothes everyday and anyway I don’t need to… I think I’ll settle for once a week tho. I found on tiny home boards a small washer set up that spins also that might work for you if you do not have kids or cleaner than my three boys I am buried in laundry but these washers that I saw were pretty cheap and not huge so might be good for your needs I will try find my notes on it and post the names if you google tiny home washers you should get some hits and find some as well. I use this system after YEARS of one day a week all day laundry. One load a day start to finish for a family of five. Mon whites, Tues darks, Wed lights, Thurs jeans, Fri towels, Sat jeans, Sun bedding. Some weeks we won’t have anything to wash on a particular day ( maybe it was a sweats and khakis week), so we take a day of rest 🙂 Never been easier! I’ve been doing this for years… We work at Disney and wear ‘costumes’ everyday. We come home put everything in the washer when we lay down to watch TV- turn washer on. When the show is over we switch. In the morning we put it back on. Almost no folding required ? We only have 4 people, but everyone wears multiple clothes per day. 2 kids: school uniform, gym/sports clothes, regular clothes to put on after cleaning up after practice. Mom and dad: work uniform, regular clothes before/after. We also have irregular schedules due to both of us working retail. Everyone always recommends routines, but that is very hard when my shifts vary from 4am-1pm to noon-9pm and everything in between. Does anyone have any ideas? I work retail also, my work schedule can vary anywhere from 5am to 1:30 to 4:30pm to 12:30 am or anything in between. Instead of using a set time of the day, do laundry around your work schedule whatever it is that day. I put the laundry in the washer after I get dressed for work. Switch it to the dryer after I walk in the drawer after work. Fold and put away after we cook and eat a meal. This way I have a routine so I don’t forget, but it is not tied to a specific time of day. Good Luck! For the past 20 years I’ve had the same laundry routine. On Wednesdays I wash towels; Friday nights I wash my husbands uniforms. Saturday I sort my laundry (for a family of 4 this is usually 5 loads) then I wash them one after the other. The key for me is that I always set a timer so I make the switch immediately and I fold and put away each load as it finishes. My kids are responsible putting away their own clothes. I implemented this as soon as they turned 3. Their drawers are not always neat and organized but that was not a hang up for me. 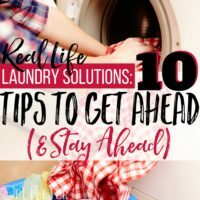 I’ve done laundry both ways, one load per day (darks/Mondays, lights/Tuesdays, jeans/Wednesdays, towels/Thursdays, sheets/Fridays) and while that worked when the kids were young (plus I was home with them all day, homeschooling,) as they are in college now, I have a different routine. I do all the laundry on Sunday or Monday. I am retired, so I am here all day. I also line-dry all my clothes. The one thing I learned after all these years is that sorting is a waste of time. One load holds all mine and my husband’s clothes for the week. Another load for jeans and towels and a third load for sheets. I shove everything in, wash with natural soap and vinegar on cold. Everything comes out clean and soft. I have decided that if an item of clothing can’t survive the washer and line-drying, it doesn’t deserve to live in my house. Simplify! My sons clothes, sheets included, all fit in one load and he washes them. My daughters clothes all fit in two loads, and she does them. Then I have the rest of the week to not worry about laundry. I have no idea what I’m doing wrong. ? I’m guessing you’ll get better with more practice 😉 Until then, turn on a show you like and enjoy! Sounds like a great idea. My husband’s work clothes get washed all by themselves because he builds tires and no laundry detergent actually gets rid of that smell. My daughter does her own laundry on her schedule, but I think I will start trying this with my husband’s, my son’s, and my regular clothes and sheets and towels. Great post, seems really intimidating. There’s no way I can do these times. Assuming the laundry is GATHERED AND SORTED already, I still have to pick up the bag, go down from the second floor, unlock the basement, go down to the basement, and then put the laundry in the machine, select the water, add detergent and vinegar… Close to 5 minutes. But it’s never gathered or sorted so…. Closer to 15. My dryer is too far away and the door is the wrong side, so I have to grab a few clothes, take two steps, chuck them in, two steps back, grab a few more, etc etc. I can’t rearrange the units. I can’t grab more at a time because they are always tangled and spun into right ropes. So this takes about 5 minutes. Not sure, I currently only very rarely manage to get any of it put away. With it being just me, I do a load of laundry every other day. Made a big difference! Off to do my load of towels for the week. Great advice! This changed my life and i never have to worry about my that one kid at 6am that tells me they don’t have any underwear! 1. Put a sorter in the basement, It makes sense to store/sort dirty clothes where you’re actually doing the laundry. You can even label baskets for various loads. (especially if the task is shared) I used to have different days for loads but now I wash which ever basket is full, this seems to be more practical and cost-effective… and one less schedule to remember. 2. Keep ONE small basket upstairs (preferably in the bathroom) to gather any dirty laundry before venturing to the basement. Before starting your next load, sort the one basket using your handy dandy sorting system 🙂 it takes less than a minute to sort one day of laundry even with a big family! 3. Put it away, EVERYDAY! 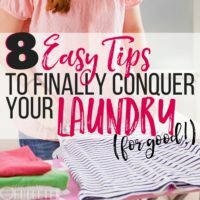 If you do one load per day, folding and putting away seems so much easier and you’re not ending up with an overwhelming pile of clean clothes.